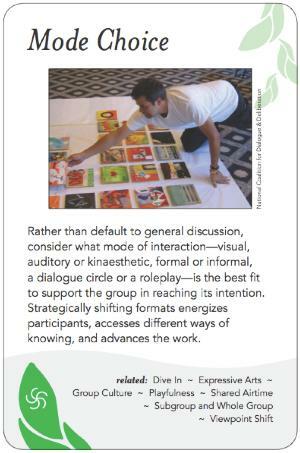 Rather than default to general discussion, consider what mode of interaction--visual, auditory or kinaesthetic, formal or informal, a dialogue circle or a roleplay--is the best fit to support the group in reaching its intention. Strategically shifting formats energizes participants, accesses different ways of knowing, and advances the work. How can we use our bodies as conflict resolution trainers? -- To shift, literally moving into another posture or stance.